Weather you’re a beginner or a seasoned player, golf is hard to play, let alone understand. No one will ever know all there is to know about the game – and there lies the beauty and magic of the game! Golf is elusive. Golf is confounding. Golf is demoralizing and exhilarating at the same time. Golf is even really stupid sometimes. 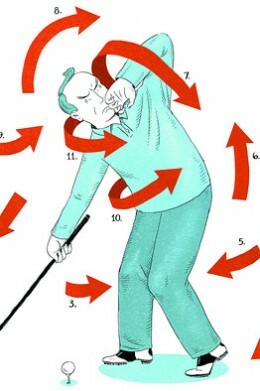 You can’t know what to do with your swing until you can freely swing the club. What that means is: “Swings” are usually learned via a mind-numbing series of things to do instead of learning what the whole swing feels like first then turning your attention to a couple of very fundamental parts – but never forgetting how the whole thing goes. Most players don’t know what a swing actually feels like. A golf swing is a physical event not a mental exercise. Stop by my campsite on the driving range and I’ll give you a quick overview of whole vs. part leraning. Don’t worry, it won’t be a lesson so you needn’t be concerned about messing up your game.